Several NU colleagues participated in the “Academic Integrity: issues and perspectives. 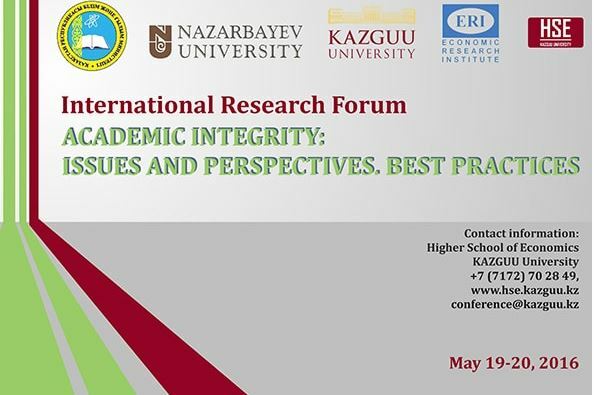 Best practices international research” forum jointly organized organized by KAZGUU and NU. It was a great interaction between students, faculty, and higher education leaders from many Kazakhstani universities. You can see conference materials here. 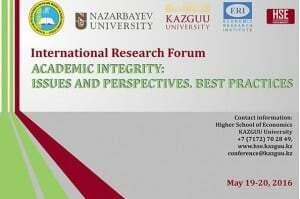 We hope forums of this kind will continue and we are looking forward to productive collaboration with Kazakhstani colleagues on this critically important issue. Please visit my Diigo collection for additional resources related to academic integrity. NU 3rd Annual Instructional Technology Showcase is this week! On April 14, we will gather together to celebrate the 3rd Annual Instructional Technology Showcase. More about the event you can learn at our blog. See you Thursday, April 14. Safer Internet Day 2016 motto announced! World Safer Internet Day 2016: Play your part for a better internet! Mark your calendars for Feb. 9 and stay tuned for University- and School-wide activities. And the new SID 2016 blog is coming along!!! We are getting positive feedback and comments from participants! Microsoft’s representative Nurlan Zhanybek sent his congratulations with the successful event and shared his pictures and content of the event. Take a look and get some faces recognized and learn more about OneNote and OneNote Classbook/Staffbook & Office365 integration. 2nd Annual Instructional Technology Showcase is Today!!! Many events start this morning at 9 am (see a program). And we will have an awards ceremony and coffee/chocolates in the atrium between block 8 and 9 at 3:30 am. We are hosting Dr. Phil Cornwell, Vice President of Academic Affairs and Professor of Mechanical Engineering at Rose-Hulman Institute of Technology, USA, this week. Please see Professor Cornwell’s bio and workshop info online. Today he facilitated a workshop Engineering, Science, and Mathematics Education at Rose-Hulman Institute of Technology. Use this link to view or download the presentation about the educational model at Rose-Hulman, pedagogical techniques such as flipped and hybrid classes, and the future of undergraduate engineering, science, and mathematics education. Sunday, October 5 is World Teachers’ Day, a UNESCO initiative devoted to appreciating, assessing, and improving the educators of the world. Congratulations! 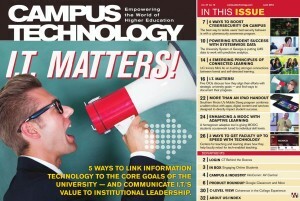 There several interesting articles in this issue related to cybersecurity on campus, MOOCs, ipads, etc. Happy browsing. Campus Technology (the conference will be mid July, in Boston) officially announces the winners of its 10th annual Innovators Awards. This year, 11 honorees were selected in six categories out of 215 nominations submitted from outstanding higher education institutions around the globe. Read more in the CT post. With more than 40 presentations and 12 round table discussions!